Ghosn said any such move to merge Renault-Nissan would backfire because of the companies' ingrained cultural differences. PARIS (Bloomberg) – Renault SA CEO Carlos Ghosn said merging with alliance partner Nissan Motor Co. was still “not feasible” after unveiling three-year goals that fell short of previous targets. Management integration with the French carmaker's 43 percent-owned Japanese affiliate is not part of the mid-term strategy because of internal opposition at both companies, the CEO said Thursday during a conference call with analysts. Ghosn said any such move would backfire because of the companies' ingrained cultural differences and determination to remain independent. Renault today announced its first medium-term plan since the 2008 financial crisis, when Ghosn scrapped 2009 targets for a 6 percent operating margin and 3.33 million deliveries. The CEO today pledged 3 million in annual sales by 2013 and a margin of more than 5 percent. “A merger of Renault and Nissan would immediately lift the value of Renault's equity and Nissan's,” said Max Warburton, a London-based analyst with Sanford C. Bernstein, who has an “outperform” rating on the shares. 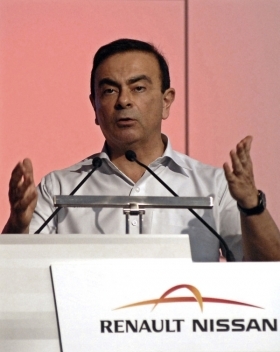 Ghosn's opposition to full integration “misses the point,” he said. Renault is counting on the Duster pickup and other models in its no-frills “entry” range to power an emerging-market expansion as it adds capacity in Morocco, India, Russia and South America. Investment, research and development spending will be capped at 9 percent of company revenue, while more vehicle designs are pooled with Nissan. The company also pledged to reduce direct production costs by 12 percent and increase capacity utilization at underused European factories by 20 percentage points. EV car sales will reach 100,000 a year by 2013, Ghosn predicted, drawing on vehicle, battery and motor production lines in France. “If this is Carlos Ghosn's idea of a strategy for the next years, then the market will take a very negative view,” said David Arnold, a London-based analyst at Credit Suisse. The “prudent” 2013 sales target of 3 million vehicles reflects earlier “disappointments we had with some models” that caused Renault to miss previous volume goals, Ghosn said. The company is predicting a European auto-market contraction of as much as 2 percent, with its home French market shrinking 8 percent. Markets outside the region “will remain dynamic,” Renault said Thursday. While the company's second-half net income was swollen by 2 billion euros in proceeds from the sale of a stake in Volvo AB, earnings before interest, tax and one-time items came to 319 million euros, or 1.7 percent of sales. The operating margin in the first half was 4 percent.